Tableware is something that we are probably going to use at least once a day, every day. It’s important then that we choose wisely and create a collection that will suit our individual style, whilst also being fit for its intended purpose. Philip Morris & Son have put together a handy buying guide to help you make the right decision. 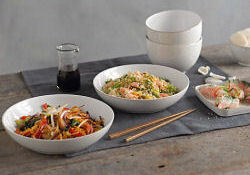 Choosing the right tableware is easy when you know how, it’s all about FAFF! Worry not, that doesn’t mean you’ve got to stand in the china department hemming and hawing for hours on end! It stands for Function, Appearance, Features and Format. Take into consideration what you will mostly be using your tableware for; this could be everyday use such as a welcoming tea after work or school. Formal use such as dinner with friends, or informal use like the Saturday night takeaway you’ve been looking forward to all week! Keeping this in mind will help you to make an informed decision about which pieces to choose from within a range. 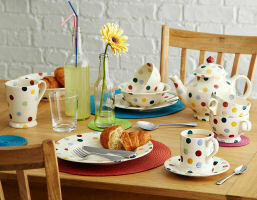 Only you will know which colour, shape and style of tableware will best suit your personality and home. There is a multitude of ranges available that will allow you to mix and match that will really make a statement. You can even put together a matching collection yourself! Bear in mind you’ll want to use your tableware for different occasions, so look for something adaptable. (Gents: the key phrase here is “yes, my sweet, I’m sure it will look lovely”). One of the first things we all check when buying tableware is if it’s safe to use in the microwave and dishwasher. It’s an important box to tick but there is much more to consider such as durability, stackability and versatility. Choose something that can hold its own against the rigours of everyday use and can then be stored neatly and efficiently when it’s not in use. By format, we mean individual pieces or boxed sets. Choosing individual pieces will allow you to create a tailor-made collection that is just right for you. However boxed sets are a great way of starting a collection, which you can add to over a period of time. Occasional sets such as tea sets will typically include a teapot, sugar bowl and cream jug, which can be extremely useful for a particular special occasion. 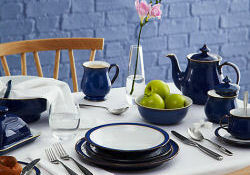 Denby, Emma Bridgewater, Maxwell & Williams, Portmeirion, Royal Worcester, Tableware. Bookmark. 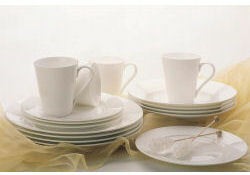 Tableware is an important item that is used everyday usually made of ceramics, plastic or melamine. We must choose good quality equipment because if you are not careful when buying can get products that contain harmful chemicals that can cause disease directly or indirectly. Give our best families through the food we make as well, using safe cooking utensils.